Mount Usu, Japan — Volcanic ash deposits from ongoing eruptions may trigger mudslides in Hokkaido, warned Japan’s Meteorological Agency on April 19. Removal of ash from Japan’s northernmost island was critical to maintain safety standards, officials said. They gave top priority to agricultural crops, wooden houses with ash-laden roofs and the major highway bordering the hot springs resort of Sobetsu at the base of the volcano. Mount Usu, March 31. Asia Air Survey. White Island, New Zealand — After a year of quiescence, significant volcanic tremors began twitching White Island’s seismograph needle again on April 6. 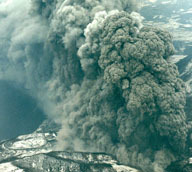 Early that month, a 10-meter vent named MH also began releasing steam and small ash eruptions. The activity, combined with higher than normal values of sulfur dioxide flux from the volcano, prompted staff from the Institute of Geological & Nuclear Sciences to raise the alert level for White Island on April 18 from 1 to 2, confirming the volcano was restless and a threat of eruption existed. Popocatepetl, Mexico — The volcano known as the “Smoking Mountain” exploded on April 2, sending a plume of ash 2,000 meters into the sky. Similar explosions also occurred on April 17 and again on April 19. Slight fumarolic activity continued through the end of the month. The activity was consistent with the destruction process of the new dome that was first reported growing on Feb. 25. The volcano remained under a yellow alert with a recommended safety zone of seven kilometers. Guagua Pichincha, Ecuador — On April 10, a series of eruptions sent ash clouds rising over two kilometers high. More than 100 seismic tremors were recorded during the eruptions. A yellow alert was issued for the capital, Quito. On April 16, the volcano sent clouds of vapor 500 meters into the sky. Officials from the Geophysics Institute of Ecuador stated that rock-fall signatures, degassing and dome growth indicated a major eruption could occur in the near future with little or no warning. Mt. Etna, Italy — On April 26, an airbus with as many as 147 passengers and crew encountered lapilli fallout just after the Southeast Crater’s 51st eruption. Sctratches heavily damaged the windshields of the airplane, but it managed to return safely to the Catania airport. Residents in eastern New York and Montpelier, Vt., experienced a magnitude-3.7 earthquake on April 20 with no reports of damage. The earthquake was located in the same general area as the magnitude-5.1 earthquake of Oct. 7, 1983, that caused minor damage and was felt in 12 East Coast states and two Canadian provinces. Quito, Ecuador — About 150 landslides killed 15 people, destroyed homes and forced scores of evacuations from the capital after six days of nonstop rain in mid-April. Rescuers, working April 13 to evacuate babies from a day-care center, formed a human chain and lashed themselves together with rope to avoid being swept away from flash floods, reports said. Szolnok, Hungary — The swollen Tisza River reached record levels, exceeding 10.6 meters on April 16. Such flood levels for the Tisza have a one in 500 chance of occurring in any year. Army helicopters dropped deliveries of sandbags to workers on saturated roads and bridges that could not support the weight of vehicles. More than 7 million sandbags have been used. More than 20,000 civilians and 2,600 soldiers worked around the clock to reinforce dikes along the river, Hungarian authorities reported. Bangkok, Thailand — The New Year celebration, which began this year on April 13, traditionally involves sprinkling scented water on friends and family to symbolically wash away sins and keep cool during the region’s warm season. Unseasonably rainy weather, however, brought on floods that inundated 20 low-lying areas in Bangkok. Holiday traffic accidents killed 26 people and injured 180 others, The Nation reported. Los Angeles — A powerful storm hit Southern California on April 18 with estimated windspeeds of up to 90 mph. Fallen trees, crumpled motor homes and twisted metal awnings dangling from power lines left debris patterns more familiar to Oklahoma or Kansas than to residents of Los Angeles. “Earthquakes are a dream compared to this,” homeowner Diane Sullivan told the Associated Press. “We never had any damage from an earthquake. I don’t know how people can live in the Midwest.” The National Weather Service called the tornado-like storm a “microburst.” The wind, rain and lightning rolled in from the Pacific the day before, contributing to hundreds of traffic accidents. Four people died during highway crashes on April 17. Associate Editor Christina Reed compiles Geophenomena.